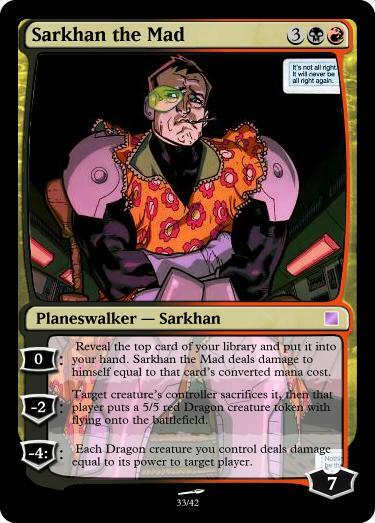 I am anxiously awaiting ANY kind of spoiler about the 4-color Commander product from Wizards that’s coming out this fall. I am really excited to be able to take apart the 4-color “Tag Team” decks that I have built (since Tag Team never took off). Lots of speculation on how it will be executed. 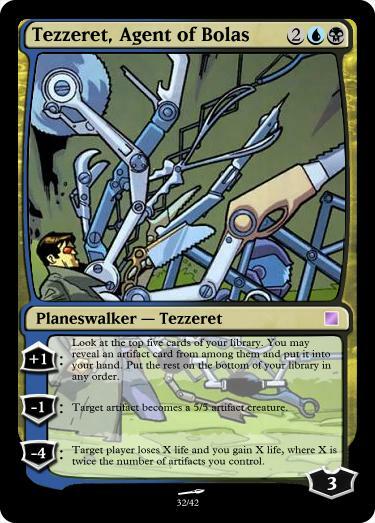 My guess is there will be a “True” 4-color legend, and then a 2-color with a hybrid ability for the other 2 colors, though I’d love too see 2-colors that are flip-walkers (Dark Trauma Spark Ignition!). 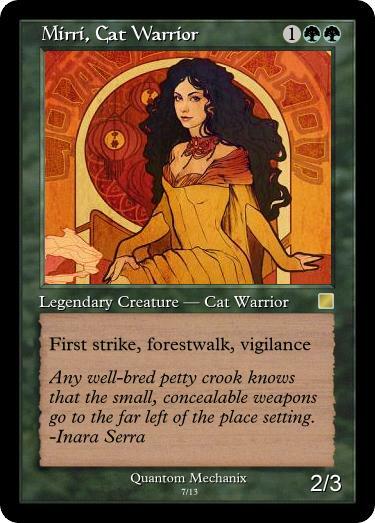 Of course I did a 5-part series on some of my card-creation attempts at 4-color commanders back in 2013 . Game #150 is finally here. This deck has been well over a year in the making. The usual suspects were all gathered, despite the impending weather. 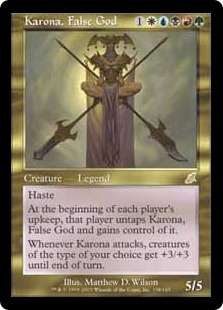 The All-Foil Karona (with every card also in Top-Loaders, deck was present, as was another Karona deck based on the new Dragons, plus Grimgrin and Gisa (whose players only have the 1 deck). A nice mix of 5 colored decks and the balance of mono-deck-owning to my too-many-deck owning. Gisa kept a 0 land hand (drawing into a land) and had 6 mana by turn 2, casting Gisa that turn. 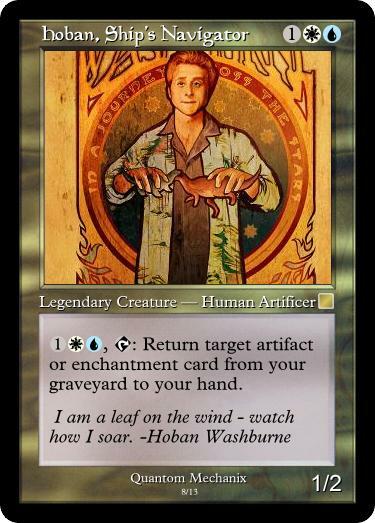 I had WUG lands and a Guard Gomazoa, Paradise Mantle and Gilder Bairn in my opening hand. 3 other players had turn 1 sol rings. K-Dragons played the mana-making Siege. A turn 3 Chromatic Lantern put me in a decent starting place, followed by a Guard Gomazoa. Grimgrin played a Noxious Ghoul. 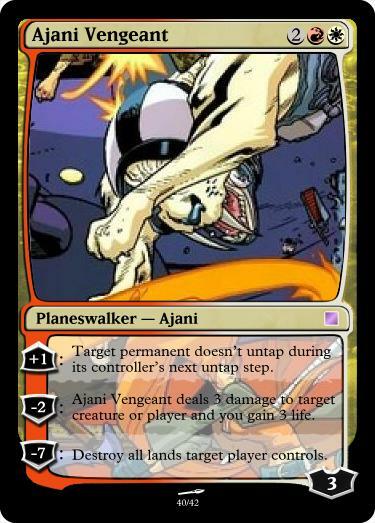 I got my first Planeswalker, Ajani Vengeant, out and -2ed him to Lightning Helix the Ghoul (which my indestructible general was not fond of), then Gisa killed Ajani. Next turn I played my Broccoli Man… I mean Sliver Hivelord and gave him a paradise mantle, but he died to a Black Suns zenith, as did Guard Gomazoa. I played Chandra Nalaar and started pinging people, She got two activations before being killed by K-Foils Nicol Bolas (Karona ended up playing nearly as many Planeswalkers as I did… silly duel decks). I played a Venser and blinked a land and also had replayed my general, but Kokusho and Sliver Hivelord got Ashes to Ashes’ed and Venser got zombie swarmed. I had clockspining in my hand and would have Ultimated Venser the next turn. 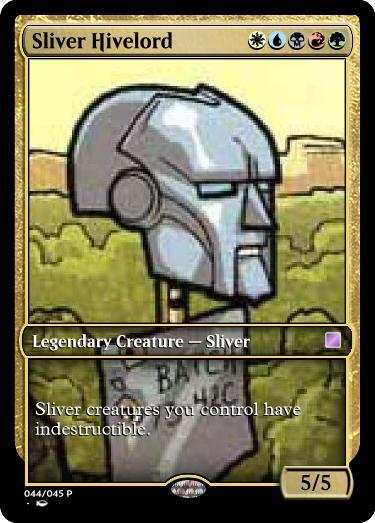 I re-cast Sliver Boss, but then K-Foil cast Hallowed Burial and I lost it (Gisa went away too). Bummer. Gisa had been pounding on K-Dragons, and ended him with a Lashwrithed Inkmoth Nexus. 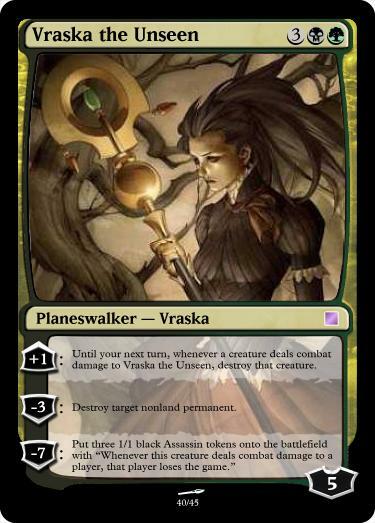 I played Vraska to kill the Lashwrithe, and would have been able to Ultimate Vraska the next turn, but Vraska died to an All Is Dust. Then a Memory Jar absolutely hosed me (I lost Doubling Season, Chain Veil, Liliana Vess and Nicol Bolas to it ). GrimGrin hit me with a 9/9 Nether Shadow. Gisa was slowly dying to bad coinflips with Mana Crypt (to the point that he had to Unstable Obelisk his own crypt to not die). I cast Tezzeret and Garruk, and then Kiora and, unfortunately, Jace the Mind Sculptor* but K-Foils Comet Storm and and Karona Attack killed all 4. Next turn Karona killed Grimgrin by Damage and Gisa by Soul’s Fire. 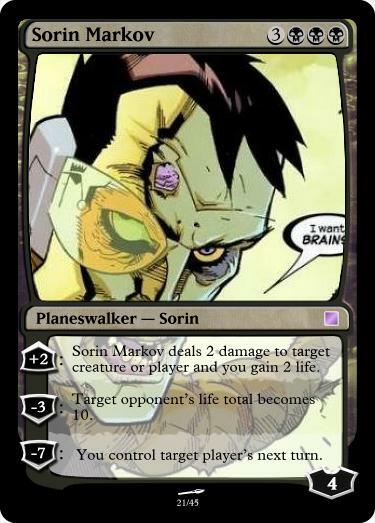 My last hope was Sorin Markov. I set Karona to 10, but since Garruk had died, I couldn’t Overrun my Karona Attack, and left K-Foils at 2. 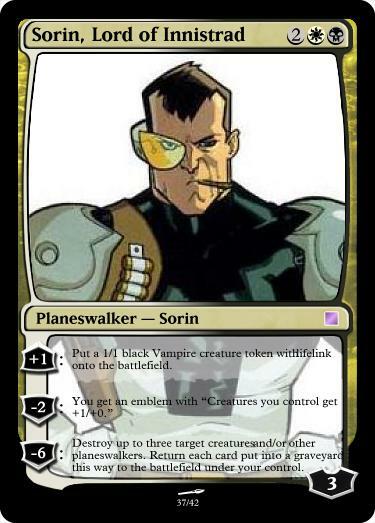 He pinged Sorin, and I clockspun him to keep him alive, but I couldn’t protect him long enough to do the last two damage, so I scooped. It was a frustrating game. Not Un-fun, but there were way too many “I was about to do something exciting, but then couldn’t” let-downs for it to be a really fun game. 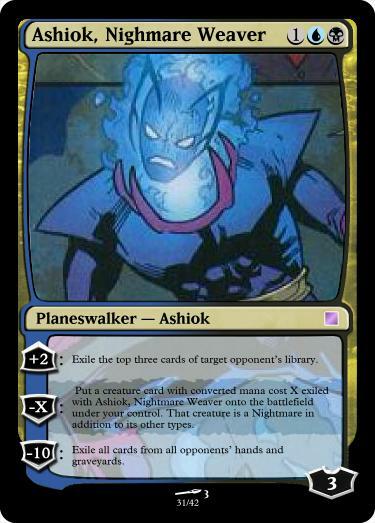 I had wanted to build a Planeswalker (“Superfriends”) deck for a long time (because I rarely play PWs). 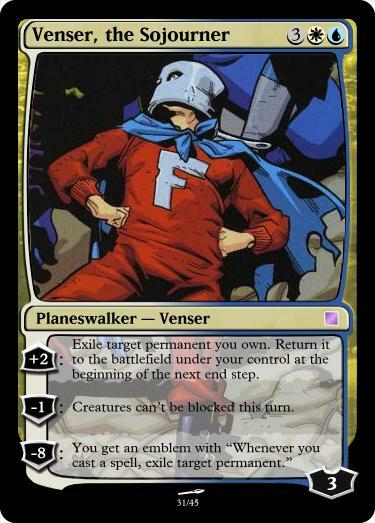 Originally I had thought of doing DC Comics Heroes as proxies (the actual Superfriends), but I realized that it would be WAY cooler to use my favorite hero team instead. (Seriously, you should all go read Nextwave right now, Warren Ellis and Stuart Immonen are great). It took me awhile to make all of the choices for who would play whom. I also ended up dipping into Runaways (another great series) for a few characters, and also Howard the Duck for Ajani, and Namora for Kiora. 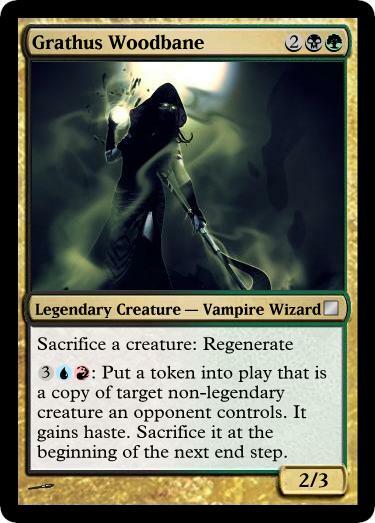 The goal of the deck is to just play as many Planeswalkers as possible and use Proliferate and Clockspinning and GilderBairn (possibly Vorel/Liquimetal Coating) to cheat more Loyalty counters out. There are some walls to block and some recursion as well. I was origninally going to see if people cared if I played Legacy Weapon (The Shockwave Rider) as my general, but then Sliver Hivelord came out (this doubly filled my need to make a Hivelord deck with NO slivers in it, where Hivelord was still relevant) and I knew that a 5/5 indestructible dude would be good for protecting Planeswalkers. 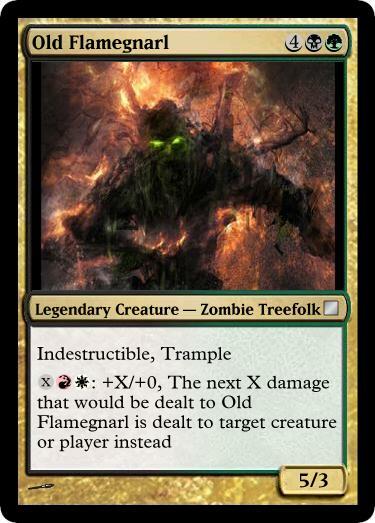 Of course he had to be a Broccoli man (and If I ever put other slivers in the deck for fun, they will also be Broccoli Men). 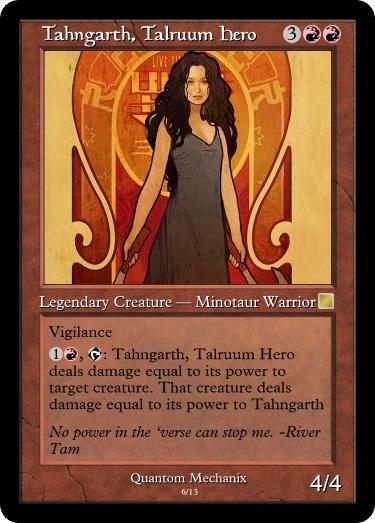 *I believe I’m the only person to go, “Oh,darn… it’s only JtMS… 😦 ” in the history of Magic: I thought it was Teferi,which would have been AWESOME, because I could have used Gilder Bairn to Ultimate him immediately for a super-rad emblem… silly confusing Proxies. I played Animar for the second game. Had a really fun looking opening hand, but didn’t draw in to blue mana. Even after a Reforge the Soul (where I lost many great things) still no island. Animar never even got cast, and Karona(Dragons) got a pretty brutal Scourge of Valkas/Baby-dragon-every-upkeep/Utvara Hellkite combo on that killed us all. Bummer. Next game I played Teysa #1 and was doing okay. Reforge the Soul (again) dumped stuff in my hand, but Teysa can get stuff back. I had some Sun Titan, Murder Investigation, Karmic Guide, Debtors’ Knell, Teysa good times. I did get brutally NIhil Spellbombed because I forgot to exile a Junk Diver. I had just played Grave Pact, Ashnod’s Altar and Soul Warden, when it hit closing time. This is the updated Nextwave: Agents of H.A.T.E. “superfriends” collection. I made a few adjustments, from the previous one. 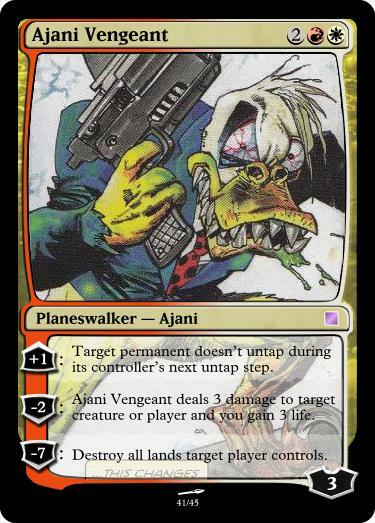 Ajani wasn’t working as random splash page sabertooth white-tiger, so he became Howard the Duck. 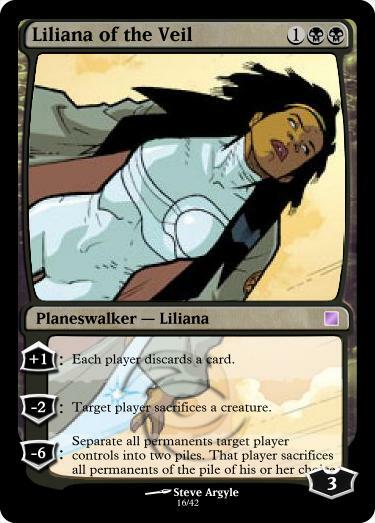 I also dipped into Runaways for a few planeswalkers, and did up a few Lands and other key cards (I really like my Doubling Season and Command Tower). 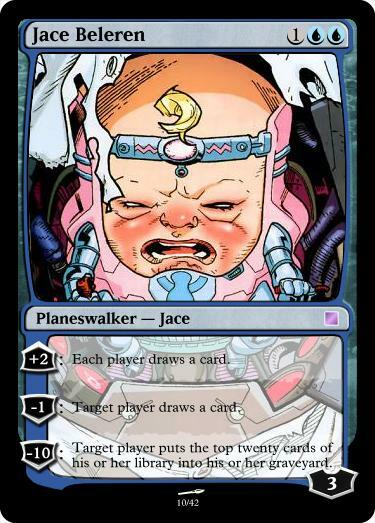 I’m also pretty psyched to have Devil Dinosaur as Ugin and I like the BabyMODOK/ElvisMODOK as Baby Jace/Big Jace (and Jace as Number None/Modok in general). 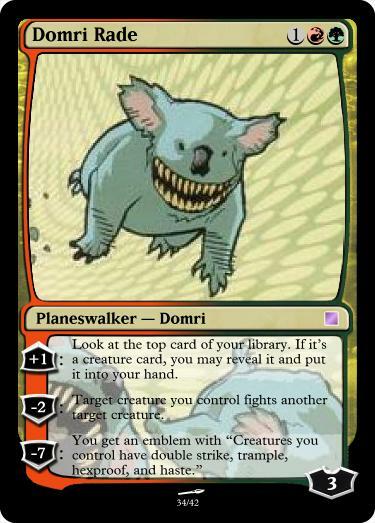 Not every one of these guys made it into the current deck, but they are still cool. 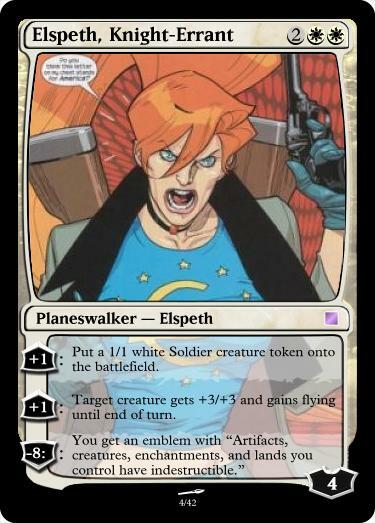 I’ve had cards set aside to make a “Weatherlight Crew” theme deck for quite awhile (with Legacy Weapon as my 5-color “General,” breaking the rules of the format wide-open). …thus we have: The Big Damn Heroes. And Sisay was the obvious choice for his second. I was torn over who would be the better Hanna. In the end the Navigator/Pilot theme won out. I also imagine Artificers to be like Archaeologists… which are like paleontologists and…. Dinosaurs. Also, similar fates. Kaylee was the other option for Hanna, but in the end, she was the one keeping the ship in the air, and had a way with machines. Please excuse the off-color quotation choice. Un?requited or at least awkward love with the captain? Check! Super Badass that can “fight” anything, and had some bad experiments happen. Jayne was a tough one, he’s a bit better fighter than Squee, so he could have been Tahngarth. He’s got a bit of a bad side, so he could have been Crovax. Ultimately he was revered and worshiped unnceccessarily, so I kept him as squee. Book was another tough one. He’s not cocky like Ertai (though there’s that whole fate thing). He has a bit of a Dark Past, but I didn’t quite see him as Crovax . This one was another no-brainer. I really like the picture for the Legacy Weapon. Baddies (more coming soon) — Suggestions welcome! She really should be Takara, but Takara didn’t get her own card. Traitrous Red-head? Yes Please. The deck isn’t finished. 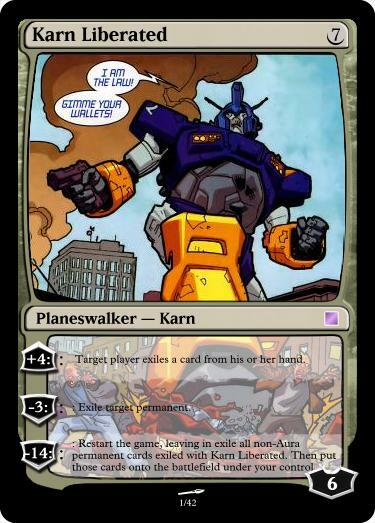 I’m going to stick with Weatherlight Story Blocks cards, of course. 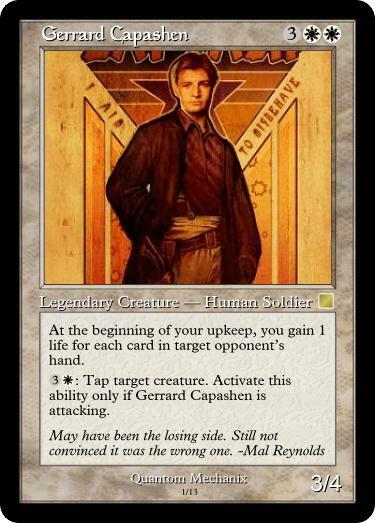 I haven’t decided who all the other Legends will be, and I don’t know if I’m going to make proxies of every card, or just the Legends. 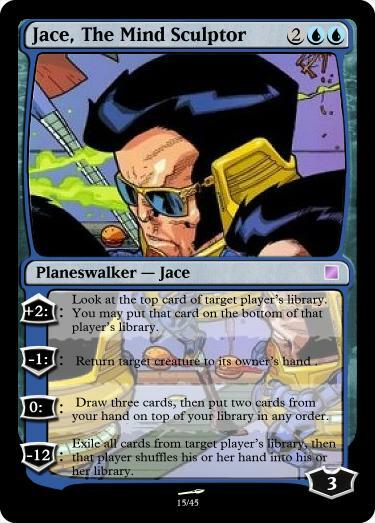 I’ve been planning on making a 5-Color Planeswalker EDH deck (a “Superfriends” deck), but since I only own 1 copy of certain PWs, I didn’t want to tie them all up in a single deck. Nextwave: Agents of H.A.T.E. ! 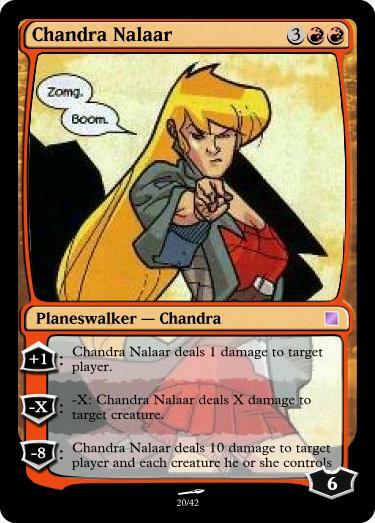 Tabby as Chandra: because, like, ZOMG! 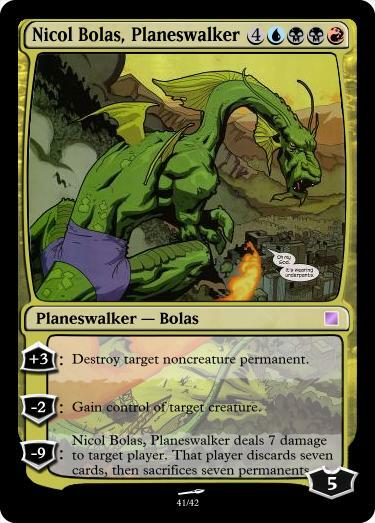 Nicol Bolas as Fin Fang Foom: Extraplanar Dragon with serious issues. A crazy white Tiger from one of the splash pages as Ajani Vengeant: an angry cat (pretty lame. Here’s Where I need help! I need sugestions! Do I keep it All-Nextwave, or do I branch out into other Marvel Characters? Should Gideon be Charlie America or Captain America? Please give me the answers! It also needs a General. Currently it’s “Child of Alara” (because it’s a board wipe), but since this deck is a Silly Deck as it is, do I just bend the rules and use a Legendary Artifact (Legacy Weapon) as the Shockwave Rider? if not, What WUBRG critter would make the best general? The rest of the deck isn’t thematic, just lots of proliferate and counter-doubling and such and a few creatures to block. 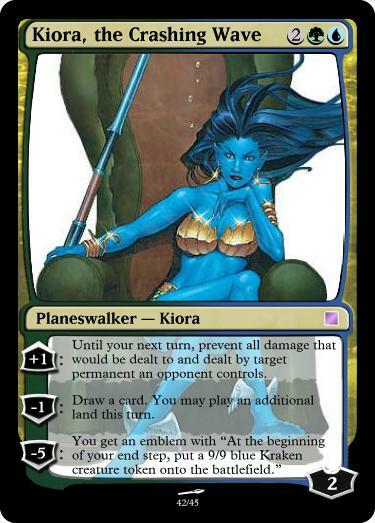 However, I may proxy up some cool scenes on things like Doubling Season. Another activated-abilities cycle. This one is missing a second RW legend (with a UG) activation, but only because I forgot to make one. 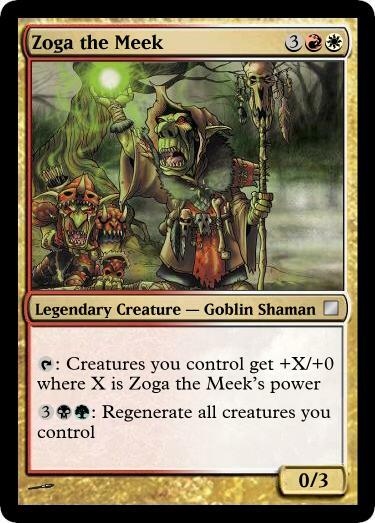 Zoga was tired of his goblin kinfolk being slaughtered (or dying due to their own idiocy), so he studied the darker arts to help keep them alive. As he grows stronger, his clan grows bolder. Vivvixia turns the natural cycle of life into knowledge and vengeance. 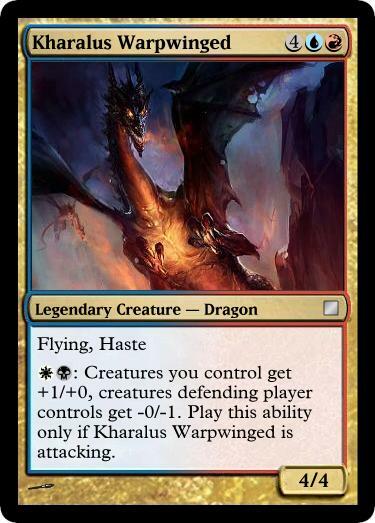 Kharalus does not breathe fire, but instead exhales literal life and death. A mutant ooze that absorbs anything around it. It does not, however, kill what it engulfs, instead amalgamates its captives. 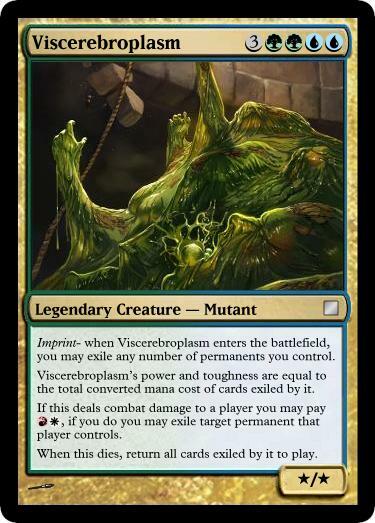 This was supposed to be creature type Ooze Mutant. This card is possibly too complicated, but I like that it can act as removal or as wrath protection. 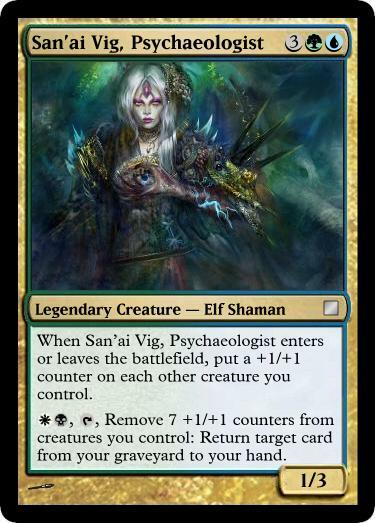 San’ai, a cousin of Momir, is somewhat of an outcast from the Simic Guild, dabbling in Orzhov magic (without their consent… she didn’t want to fill out the forms). Her +1/+1 counter ability was created before Evolve, and was meant to work with Graft creatures. 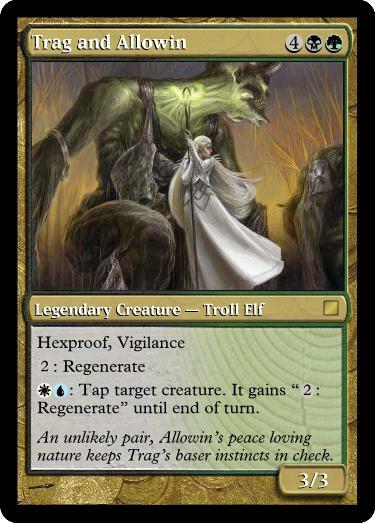 She can cast regrowth by stealing life-essence from her allies. Twin brother and sister, Pradoc and Pradice take very different paths in their magical craft. Pradoc mimics spells, while Pradice mimics souls. 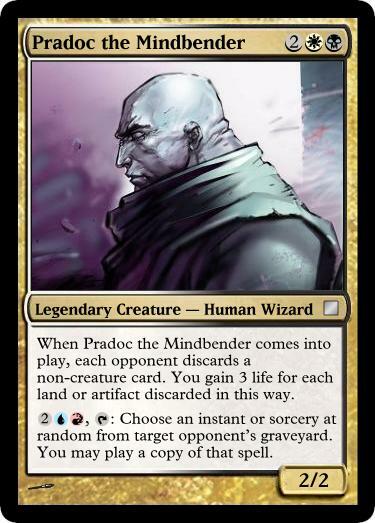 Pradoc acts as a modified Gerrard’s Verdict, pushing opponents to discard spells he can copy. Pradice works to get creatures in the graveyard for copying. 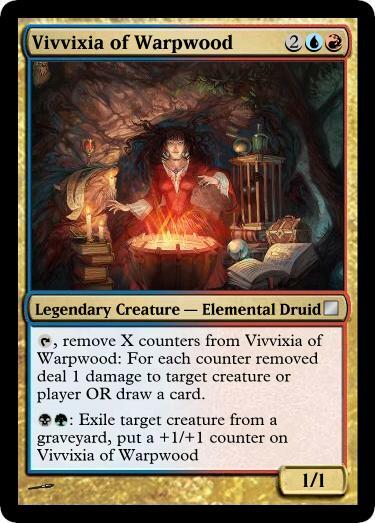 Once the tallest and oldest tree in his forest, he was the only tree left standing(Woodwing took to the air) when the forest was burned. Though he died in the conflagration, his spirit bound itself to the flames and returned to animate his body. Grathus Woodbane is the vampire that turned Kvasha into a vampire. He was a hermit who fancied himself a necromancer. One of his rituals went awry, turning him into an undead. This is another “off-color activation” cycle for achieving a 4-color identity. This time the idea was the other two colors represent the second member of the duo. A Knight and his Griffin. Brannock is an aggressive attacker, and Gyr allows him to divebomb. 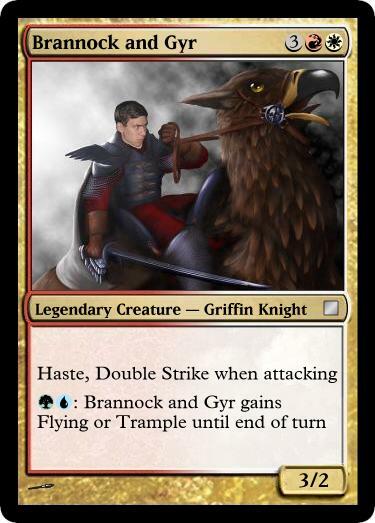 UG aren’t normally Griffin (or Gryffinfdor) colors, but the abilities granted are right for the colors. UUGG buys you both flying and trample. 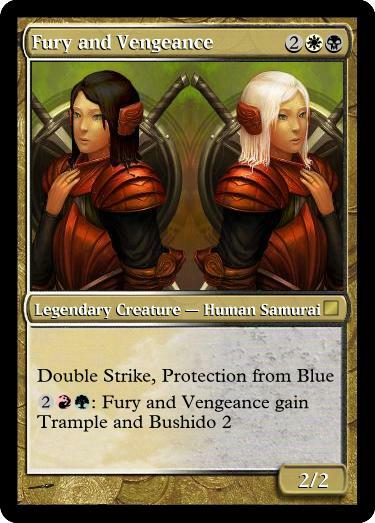 Samurai Twins. Protection from Blue is a cop-out, and I feel like I give out Double Strike and Trample too often, though Double Strike is fitting here. Paying to get Bushido is kind of cool. 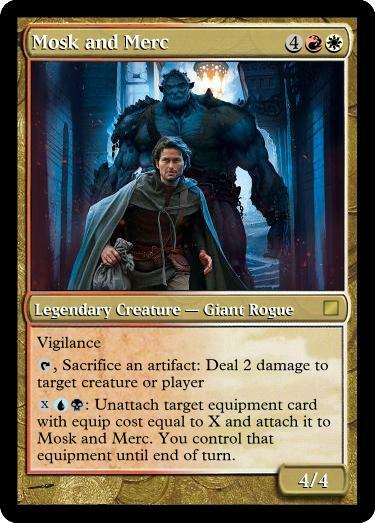 Mosk and Merc had their names stolen from the pages of the Wheel of Time series of books. Mosk guys will steal your best Sword,stab you in the face with it, and then Merc will chuck it back at, not to, you. Saralen’s name didn’t get borrowed from fantasy literature, Cersei’s did (though not intentionally). I like Twin generals like Stangg, so I knew one of these had to be that style. 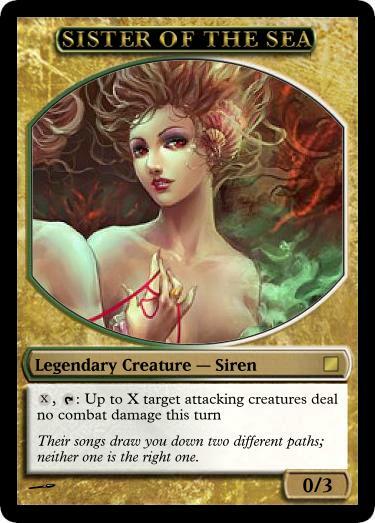 If Saralen Summons her Sister of the Sea, their siren song seduces attacks, and then soothes savagery aimed at you. Allowin’s name also comes from Sci-Fi literature. 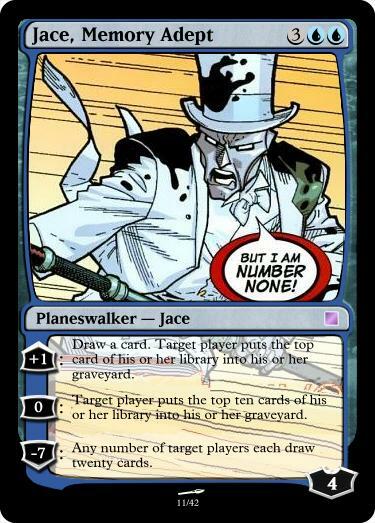 This one has Flavor Text. I know that regeneration already causes the creature to tap (at least it used to), but this allows Allowin to tap opposing creatures… they just get a random bonus of being a troll.